ACCIONA is a leading global company in the efficient management of a natural resource as limited and scarce as water. ACCIONA meets the needs of water supply of more than 100 million people in 30 countries around the world through the management of integrated water cycle, activity that is focused on serving the citizens from the collection of the water, his purification, desalination, purification and return to the environment. ACCIONA is a world leader in innovative global solutions that contribute to sustainable development in the water sector, contributing in the protection and improvement of water quality and its responsible use, directly affecting to the recovery of this resource, giving the answer to one of the biggest environmental challenges that humanity faces, such as the water availability. ACCIONA has measured for third consecutive year, the total water consumption associated with the activity of the 100% of its supply chain in 189 countries and 26 economic sectors. This initiative made the company one of the first to analyze both emissions and water consumption of 100% of its supply chain. 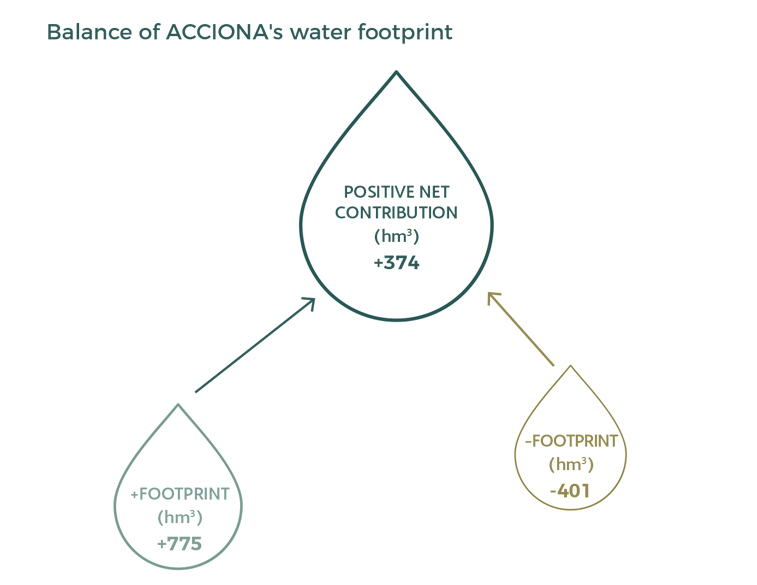 This analysis allowed ACCIONA to know, among other aspects, which proportion of water consumption in the supply chain is due to activities of direct suppliers, identify suppliers whose water consumption is more intense, compare which supply activities are intensive in water consumption in countries with water risks and identify activities of ACCIONA that have greater relevance in the global consumption calculations within the supply chain. To evaluate the physical and reputational risks of water consumption, ACCIONA uses the reference information provided by the Global Water Tool of the World Business Council for Sustainable Development (WBCSD) and the tools from the World Resources Institute (WRI). ACCIONA takes today their own solutions on purification, treatment, and desalination to areas of the planet beset by large water needs. Its water treatment plants have helped to guarantee the access to potable water in areas with water scarcity and ensure the sustainability in areas with low sanitation. Sustainable use of resources is one of the fundamental pillars of ACCIONA’s environmental strategy. Insofar as water is concerned, the Company’s balance is clearly beneficial to the environment, with a +374 Hm3 positive Water Footprint on the planet, equal to the annual consumption of a population of 7 million inhabitants. 10,6% of the Company’s water consumption comes from recycled or reused water or collected rainwater.